Free Shipping Included! 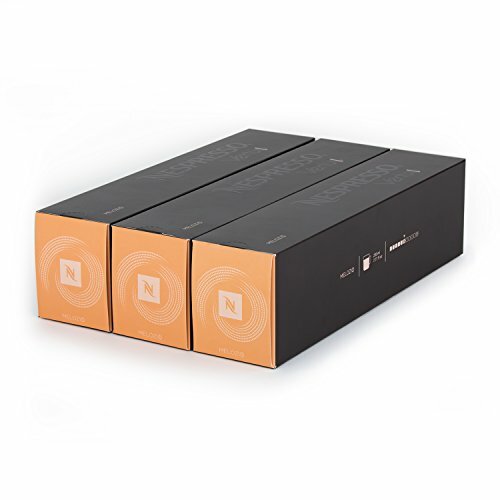 Nespresso VertuoLine Coffee, Melozio, 30 Count by Nespresso at Mystic Oaks. MPN: unknown. Hurry! Limited time offer. Offer valid only while supplies last. MELOZIO A well-balanced coffee blend for the Nespresso VertuoLine system. Sold in sleeves of 10 capsules, each capsule brews a 7.8 oz. cup of coffee. MELOZIO A well-balanced coffee blend for the Nespresso VertuoLine system. Sold in sleeves of 10 capsules, each capsule brews a 7.8 oz. cup of coffee. VertuoLine machines are designed to capture the rich textures of espresso in a full size cup of coffee. VertuoLine capsules have unique barcodes which are read by the machines to ensure perfect extraction at the touch of a button. Melozio capsules only compatible with Nespresso VertuoLine machines. Will not work with Original Line machines. FLAVOR PROFILE Fine quality Brazilian Bourbon and Central American Arabica are lightly roasted to create a rounded coffee that is smooth and perfectly balanced. Adding milk opens up the softer, sweeter sides of the coffee, enhancing the biscuity notes. QUALITY THROUGH SUSTAINABILITY Sustainable coffee production ensures our supply of high quality coffee for the future. In partnership with the Rainforest Alliance, our AAA Sustainable Quality Program protects the environment, empowers farmers and more. RECYCLABILITY Nespresso capsules are made of 100% recyclable aluminum. As the perfect protector of coffee, aluminum capsules keep over 900 distinct aromas safe from the elements. If you have any questions about this product by Nespresso, contact us by completing and submitting the form below. If you are looking for a specif part number, please include it with your message.